I have several loquat trees. I love the tree and the exquisite taste of the fruit and already had lots of good local varieties. A few years ago I bought 8 Tanaka and 8 Algerie loquats grafted in quince. Unfortunately the Spanish nursery i bought them from messed up and send me a few Magdal loquats, mixed in, instead of what i requested. To be fair i gave these a few production years but this variety isn't as good as the others. So, when i could get my hands on a few scions of other recognized good varieties, like Buenet and Redonet, i decided to graft a few of my Magdal loquats with them. 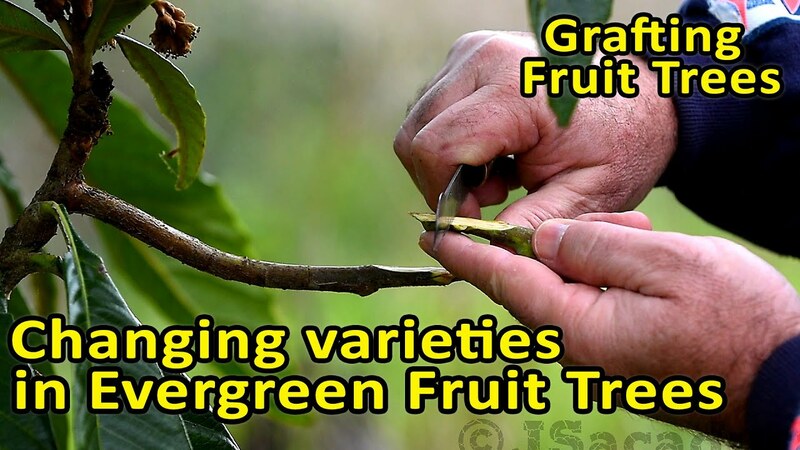 Here are the steps needed to change varieties in established loquat trees. Now, if only i could get my hands on some Rolhão II (wonderful old Portuguese variety) and Italiano I (the best Italian loquat variety) scions, i would be a happy man. Its a shame that a great percentage of of the Loquat we are seeing in stores is the variety Golden Nugget (of Californian origin). Spain is a big producer of Loquat and in the last few years is changing a great percentage of their orchards from Algerie and Tanaka to Golden Nugget. That variety was selected as its much less prone to develop the brown skin spots (sun burn spots) that this fruit usually shows and that costumers apparently don't favor, preferring to buy the clear skin fruits. These spots don't affect in the slightest way the taste of the fruit (i find that they even enrich it), although they might reduce the shelf life of the product (these areas are the first ones to decay). On the other hand, that clear skin variety is almost completely tasteless compared to any of the other varieties usually cultivated. Sometimes, i have a few visitors and give them some loquats to taste. They initially say that they don't care much for this fruit (they are used to the bland, tasteless variety they find in the supermarkets). After they taste a few of the varieties i grow, they rediscover this fruit and are surprised at the complex taste - that mix of acidity and sweetness of the traditional varieties, is hard to beat. This only shows that we (the human species) are very funny as a society. We prefer looks over taste and the farmer industry gives us what we want. And after enough time has passed young people don't even know how those fruits used to taste, so everything is fine. Jaime - Zone 9b - Portugal - Whish list: Sofeno Claro, Paderne, Pardinho, Bournabat, Bouhouli, Thermalito, Unk. Pastiliére, Luv, Genovese Nero. I haven’t ever had a loquat, but now I’m very curious! Thank you for working to preserve valuable varieties for future generations! Do they grow happily in pots? Yes they do, and can turn into beautiful ornamental plants. But to achieve any real production, they would have to be planted directly in the ground. Jsacadura That was exactly the answer I was looking for, thank you!!! Jaime, I am a big fan of loquats and picked up Argelino (Algerie) recently. It is considered a good variety but supposedly a few others are better: Vista White, Kanko, Novak and Ed’s Delight. Avri, from Israel is also highly regarded. Most likely these are all named seedlings. There is a variety called ‘Italy’ available in collections, reputedly very sweet with low acidity. but I wonder if it’s the same as the one you refer to as Italiano. I couldn't say if Italy is the same as Italiano I. Argelino is very good when fully ripe but it was selected mainly for its size, pulp thickness and small seeds. I have local loquats that have a more intensive loquat flavor but they lack the size, the thick pulp and have big seeds, so they are not commercial. I have Italy, Kanko, and Macbeth. Italy and Kanko are both incredible! I can't recommend them enough. Unfortunately, our temps dipped down to 8 degrees this winter, which is low for central Texas. The trees still have their leaves and look great, but the little loquats are toast. I guess I'll be waiting another year for fruit. Jaime, have you grown any from seeds and what were your results? Thanks for your answer JamesB. I have several loquats that were grown from seedling and JamesB is right. Most will be too acidic (although with a very strong 'real' loquat flavor), take a long time to bear fruit and the fruit will be small. Nevertheless, there were lots of very good local seedlings all over Portugal that people used to replicate locally.Most of them appeared spontaneously and later were grafted or air layered to preserve the variety. Unfortunately, most nurseries now only sell Argelino or Tanaka, with the occasional rare, very good, non unidentified seedling mixed in. Thanks Jaime for the info. I am growing a seedling tree that a man gave me. Hopefully it will give some good fruit in a few years. Nice nespera. I looked into finding/growing some of these after my Portuguese relatives talked about them. Bass was selling some seedlings. I was just thinking about this topic this morning. There is not much research on them (in English anyways) that I found. It seems like in Ohio zone 6a it won’t be possible, even in a hoop house to try and extend the growing season. I’m I right on this? I have a friend that went to Switzerland to work and likes Nêsperas so much that after a few years he took a plant with him. Every year he builds a shelter for the loquat and has managed to succeed in producing a few fruits. As i said the problem is that loquats flower in late fall, early winter and the fruit develops through the winter maturing in April/May, so it will be very difficult in a 6a zone, unless you have a greenhouse. I've just found that Rolhão II and Italiano I are two varieties stored at a Spanish loquat germoplasm repository (link below) . Very vigorous variety, semi-open bearing and an average of 3 side shoots per central bud. Approximately 88.5% and 29% of the central and lateral shoots, respectively, they are fruitful. Very productive variety. Full flowering in the third week of November (10 days before 'Algerie'). Intermediate panicle of moderately abundant flowering (average of 160 flowers / panicle), yellowish white color and a curd of 6.11%. Full ripening in the first week of May (1 days before 'Algerie'). Flattened fruit, rounded cross section, rounded peduncular area, cavity of open calyx and flat apex. Both the skin and the pulp are orange. Average weight of 51.38 g, average size of 45.15 mm and thickness of the pulp of 11.26 mm. Easy peeling and very good flavor. Seeds of oval shape, average weight of 1.68 g and an average of 4 seeds per fruit. Vigorous variety, open bearing and with a majority of 3 lateral buds per shoot central. 100% of the central shoots are fruitful and 90% of the lateral shoots also they are. Very productive variety. Leaves of large size, with spaced teeth. Acute apex shape and section Transverse plane and curve. Full flowering in the second week of November (3 days after 'Algerie'). Conical panicle with abundant flowering (average of 201 flowers / panicle), white and a fruit set of 6.17%. Full ripening in the first week of May (3 days after 'Algerie'). Oval fruit, slightly angular cross section, obtuse peduncular area, cavity of the open calyx and concave apex. Both the skin and the pulp are colored orange. Average weight of 69.30 g, average size of 46.06 mm and thickness of the pulp of 11.25 mm. Easy peeling and good flavor. No incidence of purple spot and mottled and very light tendency to cracked. Soluble solids: 9.32 º Brix. Acidity: 10.30 g / l ac. malic Firmness: 1.03 Kg / cm2 Seeds of elliptical shape, average weight of 2.61 g and between 3 and 4 seeds per fruit. Marbled tegument. Now i just have to find a way to charm them into sending me a few scions (which would be very difficult) as they only make them available to firms. It's a shame that i have to turn to another country when trying to obtain Portuguese varieties, as the local agricultural authorities that preserve and study Portuguese varieties, also don't make them available to the public. It has several fruit species, and many (now) rare varietes of Loquat and Figs. All contacts to obtain cuttings failed. The reply is always the same - they are studying the varieties to see which ones have the best agronomic characteristics and only when the studies finish they will make them available to the nurseries and other firms, if they show interest in selling a few commercially. Curiously, a few years ago, during the Economic crisis our country went through, a few of these collections were lost because, without money, some were neglected or the land was reclaimed from lack of pay. If some of those varieties were in the hands of fruits enthusiasts they would have been preserved, but no, they were in the hands of the government specialists, so now they will have to try and find the original trees to collect more material, once again and, in some cases, the tree might not be there anymore. Last edited by Jsacadura; 12-29-2018, 10:55 PM. Thanks for all the info on these amazing cultivars! I've been interested in Rolhão II for several years and must now add Italiano - I to my wanted list along with Buenet and Redonet. What can you tell us about those last two? I just bought a Gold Nugget variety last year. I was going to look around for some scions of different varieties to graft. Where do you all get your scions from? I get them from some friends that send them by mail or i buy a small tree of the desired variety and take some scions to use on my established trees. I too have what I think is a Gold Nugget. It came with the house and is big tree that is probably 20+ years old. I have successfully air layered it and created two more potted trees. I too am interested in locating some different varieties to graft. I found some scions at Fruit Wood Nursery but I am not sure what would be a good variety to try. Been away to the forum for sometime due to a death in the family. When i can, i will try to answer some of the questions you are asking. Regarding scions, as i'm located in Europe, sending scions of other varieties it's not possible. I would check other forums like "Growing Fruit" and would ask for scions there. I don't have access to that variety, over here, so i can't say how it tastes. What variety would you recommend for someone that likes tart fruit? I was referred to your youtube channel regarding the fig pollination video. I couldn't see how to contact you there to see if I could share your video via a website blog post. Do you allow that? Thanks! Argelino to me, is one of the best, being a good mix of tart with some sweet. Regarding the video, you can embed the video in your website blog post, no problem. Your location matters a lot. Varieties good in so cal are not good in nor cal etc. 1. Vegetative characteristics Variety of medium vigor, erect bearing and with an average of 3 lateral buds per central bud. Approximately 90% and 32% of the central and lateral shoots, respectively, they are fruitful. Productive variety Medium-sized leaves, with average tooth density. Middle apex shape and curved cross section. 2. Flowering Full flowering in the second week of November (5 days after 'Algerie'). Conical panicle of very abundant flowering (average 227 flowers / panicle), colored yellowish white and a fruit set of 4.10%. 3. Characteristics of the fruit Full ripening in the first week of May (2 days after 'Algerie'). Fruit elongated rounded, slightly angular cross section, zone peduncular obtuse, slightly open cavity cavity and flat apex. Both the skin and the pulp are orange-yellow. Average weight of 58.20 g, average size of 43.09 mm and thickness of the pulp of 10.68mm. Easy peeling and good flavor. Soluble solids: 11.03 ºBrix. Acidity: 15.64 g / l ac. malic Firmness: 1.46 Kg / cm2 . Seeds of elliptical shape, average weight of 2.83 g and an average of 2-3 seeds per fruit. 1. Vegetative characteristics Vigorous variety, open bearing and with an average of 2 lateral buds per shoot central. 100% of the central shoots are fruitful and 85% of the lateral shoots also they are. Productive variety Leaves of large size, with slightly spaced teeth. Apex shape acute and curved cross section. 2. Flowering Full flowering in the first week of November (9 days before 'Algerie'). Conical panicle of very abundant flowering (average of 273 flowers / panicle), colored white and a fruit set of 6%. 3. Characteristics of the fruit Full ripening in the second week of November (1 day before 'Algerie'). Rounded fruit, round cross section, rounded peduncular area, cavity of the calyx slightly open and flat apex. Both the skin and the pulp are colored orange. Average weight of 52.66 g, average caliber of 44.72 mm. and pulp thickness of 10.17mm. Easy peeling and very good flavor. No incidence of purple spot, cracked and mottled. Soluble solids: 11.93 ºBrix. Acidity: 8.04 g / l ac. malic Firmness: 0.76 Kg / cm2 Seeds of elliptical shape, average weight of 1.60 g and an average of 4 seeds per fruit.